Renfrew Group international are delighted to announce that they have won an award in the “red dot award: product design 2013” competition. 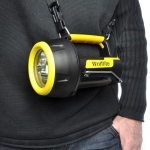 The award was given for the Wolf XT Handlamp. In an evaluation process lasting several days from a jury of 37 international renowned independent experts, the highly innovative Handlamp succeeded in winning against extreme competition to win this coveted award. “We are very honoured to have received this award for our latest innovative design,” Bruce Renfrew, Managing Director of Design at Renfrew Group. “The new design exploits advanced technology to deliver a robust, reliable and high performance Handlamp solution for the harshest environments”. 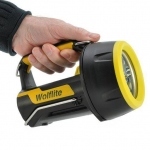 The XT Handlamp has been designed for multiple applications and is ATEX and IECEx certified for use in the hazardous areas market, such as offshore oil and gas platforms, on shore refineries, petrochemical plants and emergency services such as fire and rescue organisations throughout Europe and the UK. 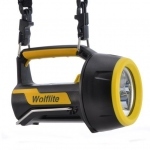 Designed for high reliability and low maintenance, the unique optical array allows the user instant light selection for spot, flood and signal beams, plus the addition of an emergency illumination mode for lighting back up power fail situations. 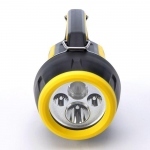 Offering optimum safety and operational features, the Handlamp uses the latest microprocessor controlled lithium ion batteries, meaning duration of up to 9 hours on full power, increasing to 18 hours in powersave mode. Another key feature is that the ion batteries charge three times faster and the lamp can be fully charged from flat in three hours. 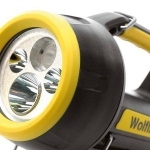 The charger retention of the Handlamp is capable of resisting forces from shocks and impacts up to a force of 15G, and has been designed to retain the Handlamp with a ‘snap in, pull out’ function allowing the user to “grab and run” , critical for the Emergency Services. 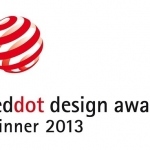 The red dot design award dates back to 1955 and is one of the world’s largest and most distinguished design competitions. This year, 1,865 companies and designers from 54 countries submitted a total of 4,662 applications with the intention of proving their design ability in an international comparison with renowned designers and up-and-coming talents.